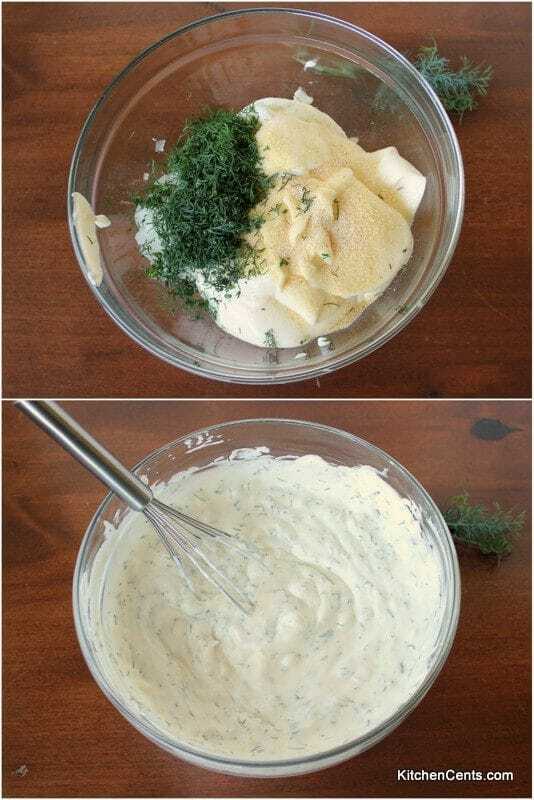 5-Minute Healthy Dill Dip – a creamy yogurt-based dip filled with tang and flavors of garlic and dill. Great with veggies, baked chips, sandwiches and more. Being healthy doesn’t mean you have to sacrifice flavor. 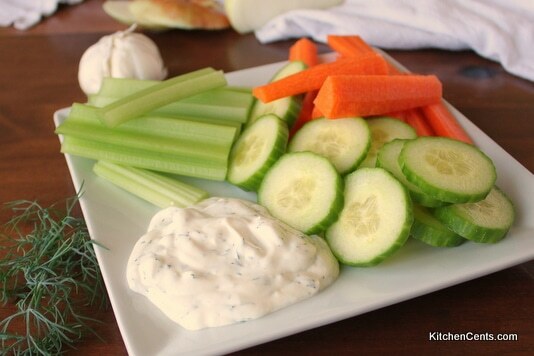 This yogurt-based dill dip is a great alternative to less healthy dips. No need going without, this dill dip is packed with flavor and tang and will keep you munching on those healthy veggies. Does it really only take 5 minutes to make this dill dip? Once the onion is mince or grate and dill is chopped (or use dried if that’s what you have on hand), it’s into a mixing bowl for a quick stir and it’s ready. Note: Like most dips, flavors marry and blend in time. Letting this dip sit in the fridge for a few hours or overnight will make it even better. Is this a low-carb dill dip? This recipe is not as low-carb as other dips but with a couple of modifications, it could be. There are about 7 carbs in 6 ounces of whole milk plain Greek yogurt. There are about 5 carbs in 2 ounces of light mayo. There are 0 carbs in regular mayo. This recipe has a Greek yogurt base with light mayo which lessens the overall calories but increases the carb count. 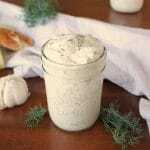 If you are on a low-carb diet and would like to still enjoy the delicious flavors of this dill dip you can make a low-carb version by replacing the Greek yogurt and light mayo with regular mayo. This will increase the calories but almost eliminate the carbs. The yield for this recipe is just over a 1 cup of dip. 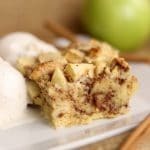 To the best of my knowledge, there are about 14 carbs in this recipe. With a serving size of 2 tablespoons (8-9 servings in this recipe) that would make each serving around 1.7 carbs. Still not bad for a “low-carb” recipe, I think. If you are carb conscious rather than calorie conscious, replace the greek yogurt and light mayo for regular mayo. Can I use dried dill (dill weed) in this recipe? Yes, you can use dried dill weed in place of fresh. When substituting dried dill weed for fresh dill, it’s at a 1:3 ratio. For example, this recipe calls for 1-2 tablespoons fresh dill, chopped. 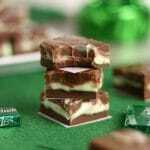 You would substitute 1-2 teaspoons of dried dill weed as there are 3 teaspoons in a tablespoon. Can I use regular plain yogurt in place of plain Greek yogurt? You can but I wouldn’t recommend it. This dip is creamy and thick. If you substitute regular yogurt it will be much runnier. It will also have an effect on the nutritional content of this dip. Greek yogurt is much higher in protein and has a lower carb count. 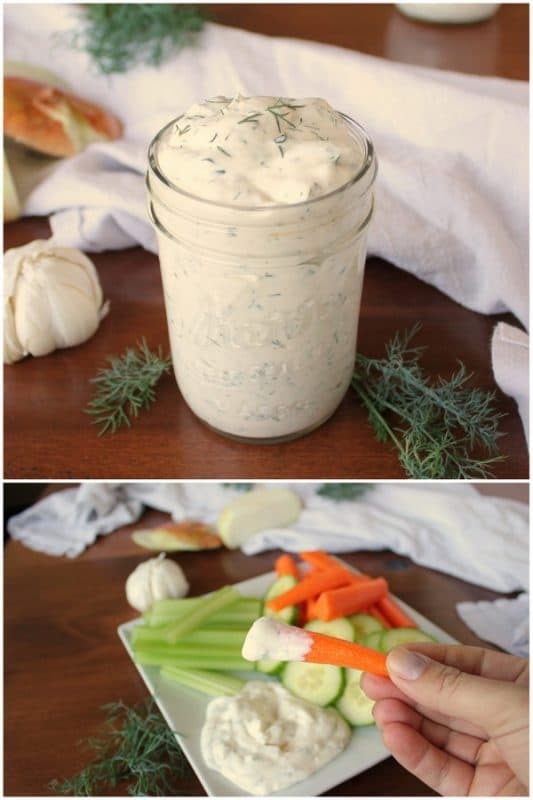 If you are making this dip for health reasons I would stick with plain Greek yogurt. How long will this healthy dill dip keep? This dip should keep for as long as your yogurt is good. With that said, make note of the expiration date on your yogurt. Store this dip in the fridge until you’re ready to use it. The flavors will enhance as the dip sits (you’ll notice a difference within a couple of hours). 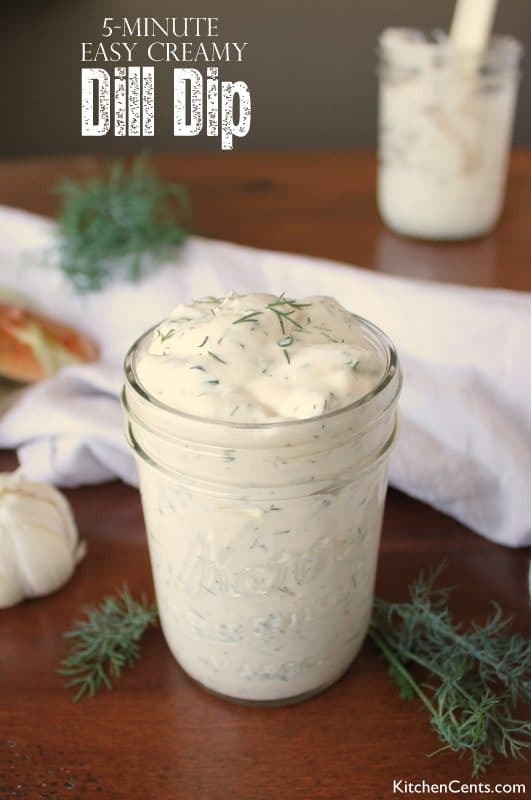 What will you be enjoying this creamy dill dip with? I LOVE it with veggies but can resist putting it on my sandwich if I have a jar of it in the fridge. 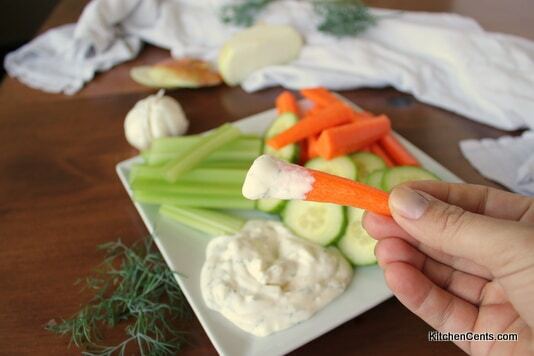 A creamy yogurt-based dip filled with tang and flavors of garlic and dill. 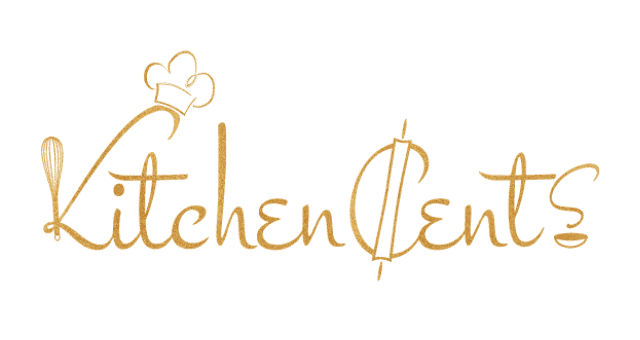 Great with veggies, baked chips, sandwiches and more. In a small mixing bowl, blend all ingredients together. For best results, chill for 2-4 hours before serving to let flavors blend. Store in the fridge. Should keep until the yogurt expiration date. 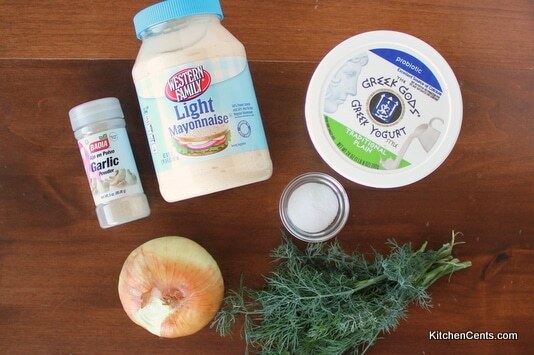 Can make low-carb option by replacing Greek yogurt and light mayo with regular full-fat mayo. This looks like my kind of dip! Quick healthy and delicious. 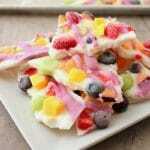 I will be making this for Super Bowl Sunday! 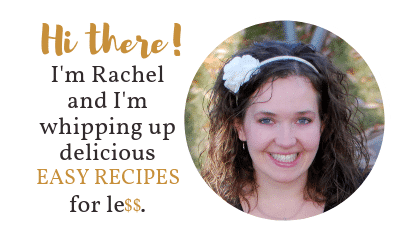 Thanks you for sharing your amazing recipes! Thanks so much Amy! It’s delicious! Hope you guys enjoy it <3 Hopefully we can get together soon!